The Honda Lawn Mower model HRX217HZA has all of the features that the other Honda lawn mowers we have reviewed on this have plus the ability to be started electrically. Just push a button and the rechargeable battery will start the engine up to 300 times in a season. It is self-propelled with variable speeds up to 4 miles per hour. Operators can set the speed based on mowing conditions and the speed that is most comfortable for them while mowing the lawn. 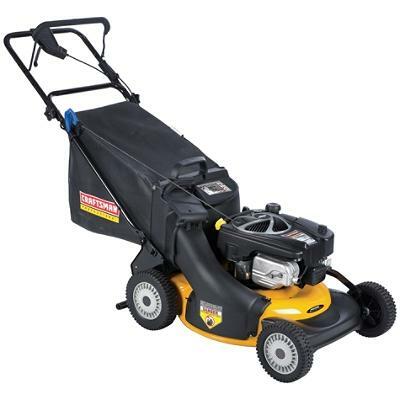 Combined with the twin blades that cut grass clippings into finer particles, this lawn mower can not only bag a larger amount of grass, you can also set it up to discharge, mulch and / or leaf shred as well. We have not tried the leaf shredding capability and would be interested in hearing from our readers how well this works. Finally shredded leaf particles will compress a great deal into the leaf bag and this could be a really great feature if it works as it is designed to. We provide a full list of specifications and features in the following. Easy starting Honda GCV190 Engine is certified to meet 50-state EPA and CARB emission levels. The Versamow System helps you to mulch or partially mulch even in severe conditions. Smaller grass clippings mean you can mow 40% farther before you have to empty the bag. The HRX design makes leaf shredding easy. The quick-release handle is easy to fold or adjust. 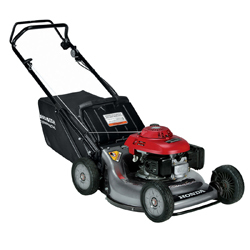 Not only is it a front wheel variable speed drive lawn mower, it can also be used as a leaf shredder as well. It comes with a 5 year residential warranty and a 90 day warranty for commercial users. the deck is guaranteed for the lifetime of the machine as long as you own it. Adjustment to one of seven height positions, discharge, mulch or bag your grass clippings and use the electric starter to start your lawn mower any time. It comes with an automatic choke so starting is always a breeze. The current price and specifications are subject to change. They can be adjusted by the manufacturer at any time. Check with you local dealer for the latest pricing and specifications. The Honda lawn mower model HRX217HYAC is another Honda lawn mower that consumers and commercial operators will find easy to use and makes fast work of cutting any lawn. 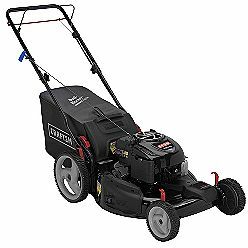 Cruise up to 4 miles per hour with cruise control variable speed mowing that easily allows you to match the speed to cutting conditions and your personal walking speed. 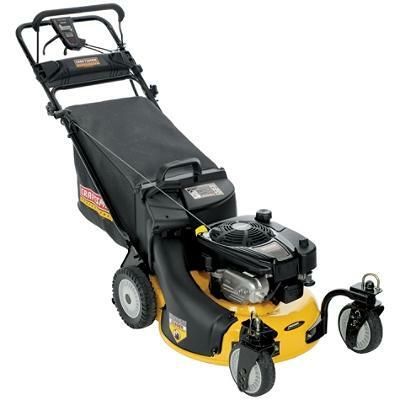 This lawn mower can also be set to one of seven positions to get the lawn height just the way you want it. It has an automatic choke and is started using a pull chord or recoil start approach. No more poor starting situations because you forgot to set the choke properly. The handle height can also be set to one of three positions to match your personal comfort level and to match the conditions that you are working in. Note the full list of specifications and features that we have listed below for this lawn mower. We also hi-light a few interesting features later on in this post. Honda’s hydrostatic Cruise Control allows precise, infinitely variable speed control from 0 to 4 mph. Honda Roto-Stop® blade stop system allows you to step away from the mower, without having to stop and restart the engine. 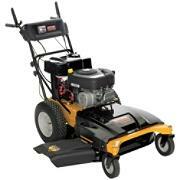 This lawn mower comes with a full warranty for 5 years for all residential use and 90 days for commercial use. Note that the deck comes with a life time warranty which is quite special in the industry. Operators can set the lawn mower to work in one of four settings – mulch , discharge, bag and leaf shred. This is one of the few lawn mowers that we have seen in our ongoing reviews that advertise leaf shredding. We would be interested in hearing how well this works, since we have not used this particular machine ourselves. Twin blades also provide greater mulching capability and cut all grass into finer clippings causing more grass to be able to be bagged and grass clipping sin general to disintegrate more quickly. 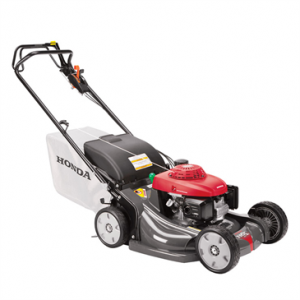 The Honda Lawn Mower, model HRX217VKA is packed with features. We have listed the specifications and features below. However we wanted to hi-light a few that may be of interest to consumers and commercial lawn care specialists. This lawn mower comes with a variable speed transmission. This allows you to match the ground speed with the cutting conditions and your own personal walking style. Set the mowing height to one of seven positions. Utilize one of the four configurations for mulching, leaf shredding, bagging and discharge of grass cuttings. 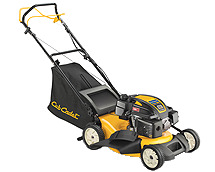 This lawn mower is also a recoil start. In other words you have to pull a chord in order to get it started which is easy to do with the automatic choke. It comes with a 5 year warranty for consumers and 90 days for commercial operators. It also comes with twin blades to increase the mulching capability of this lawn mower and it is front wheel self drive technology. Variable speed from 0 to 3.6 mph. Honda’s revolutionary Versamow System™ allows you to mulch, bag, discharge, and shred leaves. The HRX’s 21″ deck is made of NeXite®. HRX design makes leaf shredding easy. The quick release handle is easy to fold or adjust. 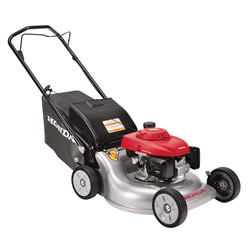 This lawn mower from Honda has ball bearings in the wheels to extend the life of the wheels and the wheels can be adjusted to one of seven positions to cut the lawn just the way you want it. Safety is a high concern and the flywheel brake system will stop the engine the moment it is released. It also has a unique leaf shredding mechanism which shreds and bags the leaves at the same time. Smaller particles means you can go longer before having to empty the bag. This is accomplished by the unique twin blade micro cut system. This Honda Lawn Mower HRX2173HYC model is packed with features but there are a couple that we have not seen in other lawn mowers we have reviewed on this site that we wanted to bring to your attention. First of all there is the hydrostatic transmission that provides a variable speed system. There are nine preset speeds to choose from to match your walking speed and / or the thickness of the grass that you are cutting. Then there is the four in one versatile system. You can convert within seconds from mulching, to bagging , to discharge to leaf shred at your convenience. You can simultaneously distribute grass clippings to the bag and discharge. 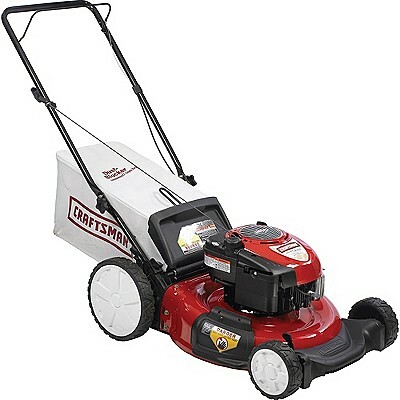 Next this is one of the few lawn mowers were you can keep the engine running and stop the blades from spinning. This is handy for emptying the bag of grass clippings without having to stop the engine. The twin blades also cut the grass clippings into finer particles when you are in the mulching configuration. Refer to our specifications section and features section for more information as well as the dealer closest to you for more details. We also really like the front wheel drive system, considering it much better than corresponding rear wheel drive systems. Ground speed can be adjusted by adjusting the speed lever or simply by pressure on the handle such that you take some of the weight off the front wheels making the wheels slip a bit and ground speed slowing accordingly. 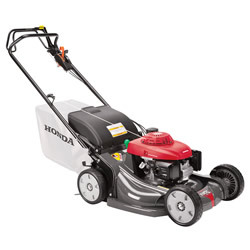 Warranty: This lawnmower from Honda comes with a warranty of 36 months for non-commercial use and 12 months for commercial use. 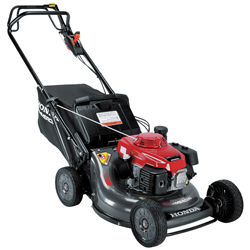 One feature of the Honda Lawn Mower HRX2173HYC that we are concerned about is the rear discharge feature. Although we have not experienced this ourselves we wonder about all of the grass clippings coming out the rear and hitting our legs as we walk behind the lawn mower. Occasionally there are sharp objects as well that are propelled out the discharge and we are somewhat concerned about being hit by one of these projectiles. We expect that most people will only use this lawn mower in the mulching mode or in the grass catcher mode. At the time of writing this post, Honda had dropped the MSRP price by $150 to enhance sales as we approach the end of the season. 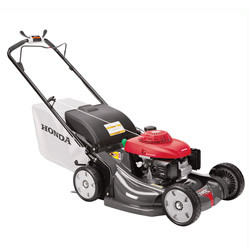 This is another Honda lawn mower that comes packed with features. There is a rechargeable battery providing up to 300 starts which should be good enough for most if not all of the season. Just push a button and your engine is revving and ready to go. The auto choke makes it a an easy start every time. This lawn mower should be easy to operate. It also comes with the hydrostatic transmission system that provides a variable speed operation with nine preset speeds to match both your normal walking speed as well as grass height or for transport to another location. Keep the engine running while changing the bag for the grass catcher while the blades stop turning. Also change from mulching to grass catcher to side discharge in seconds. There is also a leaf shred capability. Check out the long list of specifications as well as additional features that we have hi-lited later in this post. We like this lawn mower except for the rear discharge which we will discuss later on. Honda has also dropped the MSRP price by $150 at the time of writing to encourage sales as we approach the end of the season. 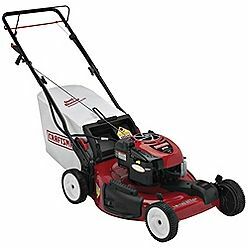 Warranty: This Honda lawn mower come with a warranty of 36 months for non-commercial use and 12 months for commercial use. 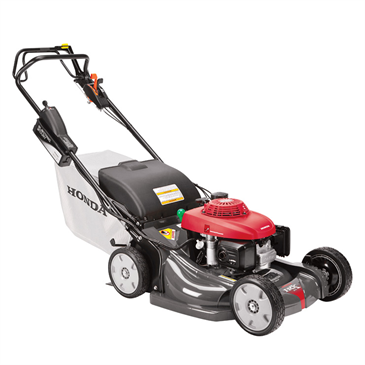 The Honda Lawn Mower HRX2173HZC is a very convenient lawn mower to use with the 4 in one grass catching, mulching, discharge and leaf shred system, electric start, self propelled and blade stop for safety. However we are somewhat concerned about the rear discharge and that grass clippings with be distributed behind the machine were the operator follows. We have not used one of these machines and so we encourage buyers to review this issue with the dealer to satisfy themselves that there will be no safety issue with this item.